With valuations stretched, investors seem to be justifying their stock purchases here with the argument that we have yet to reach the mania of 1999-2000 but history has shown us that there doesn’t have to be a bubble for there to be a sharp decline in stocks. As we saw in 2007, it doesn’t mean there is no risk of a significant market decline or that valuations are compelling and that investors should be expecting above average long-term returns from here. They should not. The above introductory comments are from an article* by Charlie Bilello (pensionpartners.com) entitled No Bubble, No Problems? On its face, it seems like a reasonable statement. After all, 2000 was the peak of the greatest U.S. stock market bubble we have ever seen. 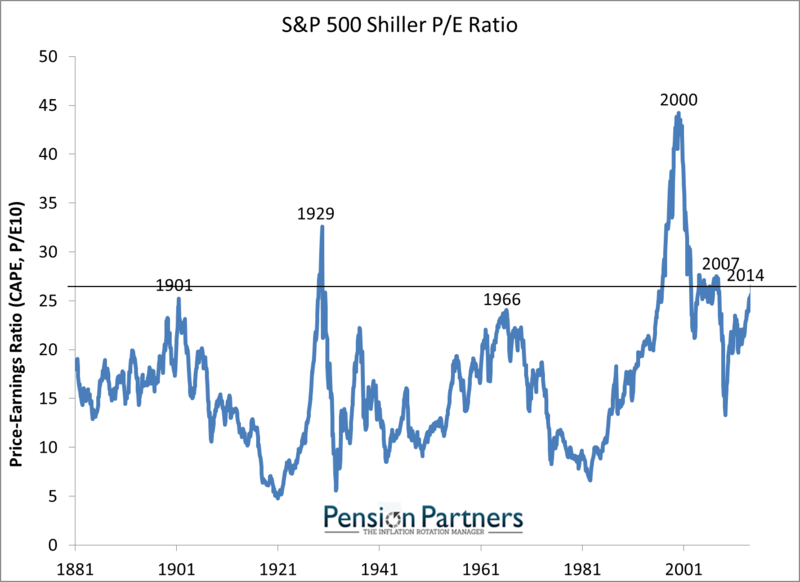 A chart of the CAPE ratio (or Shiller P/E) illustrates just how stretched valuations were back then and how we’re still far from such levels today. The issue, though, is that every Bull Market doesn’t go through a 2000-like bubble before it becomes a problem. 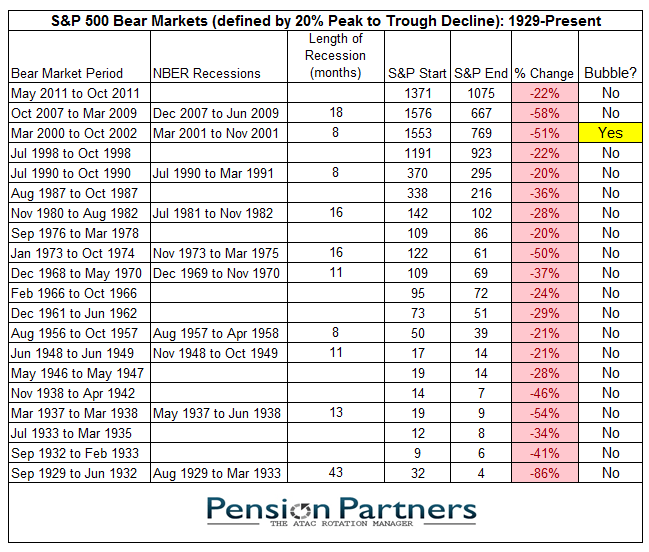 As can be seen in the table below, since 1929 there have been 20 Bear Market declines in the S&P 500, roughly one every 4-5 years. Only one of these was preceded by our collective definition of a bubble. Therefore, to argue that stocks are a good buy today and can’t go down because they have not yet reached the extremes of the greatest bubble in history is to argue two things. That you have the ability to time your exposure to the bubble to insure that you get out before it inevitably bursts. Today, many would argue on the first point that the probability of a similar bubble occurring is indeed high. After all, the Federal Reserve seems to want this outcome as they have maintained the loosest monetary policy in history five years into the recovery. If market participants are correct and the Fed does not raise rates until next July, it will be six and half years of zero percent interest rates at that point. Investors tend to do highly irrational things when money is this cheap. Thus, while I would not go as far as to say the odds of another dot-com like bubble are high, we cannot entirely rule it out. What I would argue strongly against, though, is ability of the majority investors to effectively time their exposure to such a bubble. If history is any guide, most investors will not fare well as they have a strong tendency to buy high and sell low. 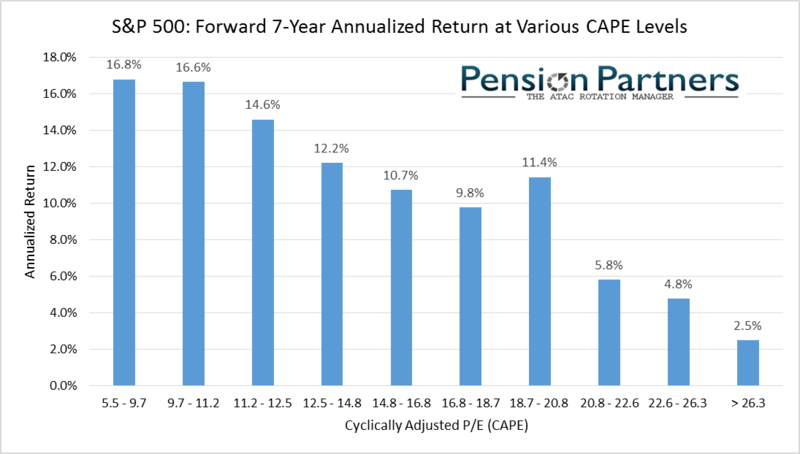 As we are approaching the 90th percentile of historical valuations (CAPE above 26), make no mistake about it, investors getting in here with hopes of another 1999-2000 bubble are indeed buying high, not as high as 1999-2000, but high enough where they should be expecting significantly below average returns over the next 7-10 years. The permanently bullish camp is correct. It is not 1999-2000. If that makes you feel better about buying stocks here, great, but it is not an argument based on logic. As we saw in 2007, just because it is not a once in a hundred years bubble, it doesn’t mean there is no risk of a significant market decline…or that valuations are compelling and that investors should be expecting above average long-term returns from here. They should not. Something to think about the next time someone tells you a story about how this mania pales in comparison to the epic dot-com bubble. Previous Decline In Gold Due to Stupidity, Greed & Stubbornness! Next What Are Factors That Motivate Gold Saying Today?